Trump called 'Medicare for All' a 'catastrophe' and 'disaster.' Here's what the plan would really do. 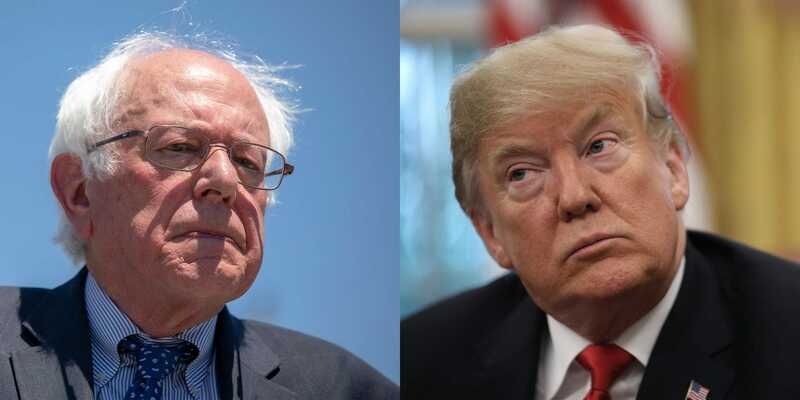 President Donald Trump has turned his attention to Sen. Bernie Sanders’ “Medicare for All” plan over the past few days. In an op-ed for USA Today, Trump bashed the idea. Later, he called Medicare for All a “disaster” during an interview on Fox News. The plan would make the federal government the single provider of insurance, eliminating private insurance and premiums. Advocates say it would give all access to health coverage and alleviate high costs for middle-class Americans. Detractors say it would upend the healthcare system and cause a massive burden on the federal government. Trump’s focus on the issue appears to be in response to Democrats decisive advantage on healthcare heading into the midterms. President Donald Trump in recent days has found a new political boogeyman in Democrats’ “Medicare-for-All” proposal. In an op-ed for USA Today published Wednesday, Trump took shots at the healthcare overhaul that has been proposed and popularised by progressive Democrats like Bernie Sanders. “Throughout the year, we have seen Democrats across the country uniting around a new legislative proposal that would end Medicare as we know it and take away benefits that seniors have paid for their entire lives,” Trump wrote. While the president seems to be zeroing in on the Medicare for All plan, the idea has been picking up steam among Democrats and the general public. To help get a sense of the issue, we’ve broken down Sanders’ plan and what it would mean for consumers, the federal government, and healthcare providers. Democrats have proposed different ways to go about changing the healthcare system: Some want to shore up and expand Obamacare. Others want to create a public option for people to opt in for government-funded coverage. But Trump’s attacks appear to be targeting specifically at the Medicare for All idea pushed by Sanders during the 2016 election. In Sanders’ plan, the current Medicare program for elderly Americans would be expanded to cover all Americans. Current Medicare recipients would see their benefits expanded as areas like dental and vision would begin to be covered. The age to qualify for the program would drop each year for four years until all Americans qualified. So contrary to Trump’s assertion that the plan would “take away benefits” from seniors, it would – in theory – expand those benefits. By eliminating private insurance, Sanders’ plan would significantly shift the cost burden to the federal government. To fund the new program, Medicare for All would impose a series of new taxes but require no co-payments, premiums, or deductibles. As Trump pointed out, a recent study by the Mercatus Center – a free market, anti-regulation think tank – found that Sanders’ plan would cost the government $US32.6 trillion over a 10-year period. But the same study determined that overall healthcare costs for the whole US system – what the government, private companies, and households paid for healthcare – would come in lower than current projections, using the Sanders plan’s assumptions (more on those in a minute). Even assuming large costs, advocates argue it would be a small price to pay to ensure every American has access to healthcare and faces lower personal costs. Several thorny issues emerge in the Medicare for All debate, ranging from doctor pay to prescription drug development. Sanders’ plan assumes doctors and hospitals would be paid by the government at a rate equal to current Medicare reimbursement rates, which are generally lower than the rate private insurers pay. This would save the system money overall, but would also significantly cut reimbursement rates for some healthcare providers. Critics of the plan argue that cutting those reimbursement rates to the Medicare level, which are 40% lower than private plans in some cases, couldn’t work because it would disincentivize people from becoming doctors and roil the healthcare system as we know it. Advocates note the plan would also eliminate a slew of overhead and administrative costs by streamlining the billing and reporting system. Instead of dealing with a confusing jumble of private insurers and plans, doctors and healthcare providers would only work with a single payer. In addition, Sanders’ plan would attempt to extract lower prices from pharmaceutical manufacturers. But critics contend that lower payments will reduce spending on research and development at pharma companies and may stifle innovation in the field. According to recent polls, a majority of Americans support a Medicare for All plan. A March poll from the Kaiser Family Foundation, a nonpartisan health policy think tank, found 59% of people surveyed supported Sanders’ Medicare for All plan, while 75% supported a public option, opt-in system. Similarly, a June poll from Politico found 63% of people surveyed supported Medicare for All. AReuters-Ipsos poll in August found 70% of Americans – including 51% of Republicans – supported the idea. But in September, former President Barack Obama praised the idea and said new Democratic politicians were “running on good new ideas” like it. Sanders’ plan, meanwhile, garnered 16 cosponsors in the Senate in 2017, with many of the frontrunners for the 2020 Democratic presidential nomination hopping on board. Ahead of the midterm elections, Democrats are hammering the GOP on healthcare, and it seems to be a political winner. According to a Fox News poll released in September, 49% of people think Democrats would do a better job handling healthcare, while just 34% of people preferred the GOP to handle it.